For the Kayaking fanatic, this is simple, peaceful and cool. 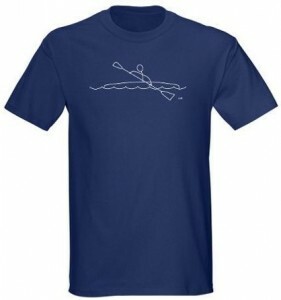 A t-shirt that features awsome line art to make up a stickman in a kayak paddling out on the water, make this your favorite shirt to wear and show off your love for kayaking. A very comfortable and durable t-shirt made from pre-shrunk 100% cotton and can be found in many different sizes and colors. Just when you think you do not have a Superpower, you realize that you are one awesome bowler. 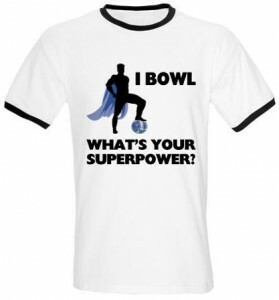 This is a t-shirt to commemorate the bowler who is so good that it just may be there very own superpower. Featuring a sillhouette of bowler in a superhero stance, one foot on the ball and a cape draping down the back with his hands on his hips. Aswell as the saying “I BOWL WHAT’S YOUR SUPERPOWER?” on the front. This bowling superhero t-shirt is a ringer style T, with different color trim around the sleeves and neck giving it a retro look. You can also find this t-shirt in many different styles, colors and sizes, so find what fits and suites you. In this world of accelerating technology and use of Apps for everything i think that this shirt has a true statement. This t-shirt features the large saying “iDad” on the front and just bellow it “no app for that”, this is a very clever t-shirt that makes me smile every time i read it. Made from pre-shrunk 100% cotton, this iDad t-shirt is very comfortable and will be very durable aswell. Comes in many sizes and colors to choose from. Make this a perfect fathers day gift or a great gift for the dad anytime. National Geographic is know to almost any one and they’re amazing TV shows and other material is used by millions of people around the globe. And now you can have your own National Geographic t-shirt with the logo of the National Geographic on it. This logo is printed on a white t-shirt witch has some fun bands around the neck and sleeves. And of course this t-shirt is available in a wide range of men’s sizes. Or maybe you know him. Anyhow we got the t-shirt that fits him perfectly. 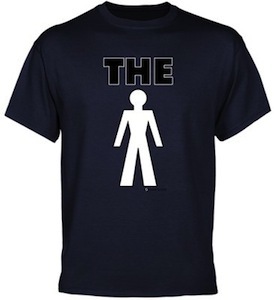 And as you can see above it is a dark blue t-shirt with the word “THE” and a picture of a Man. You can get this t-shirt in a wide range of sizes as I don’t know what the Man wears. Come check out this funny THE MAN T-Shirt. OK so you got married and now what? So you she got your because you look so amazingly hot right? 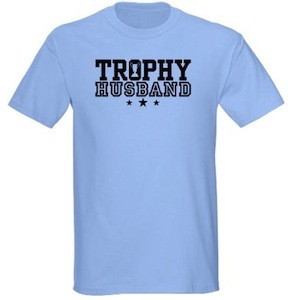 If so then you are probably a Trophy Husband and that means that this t-shirt is made specially for you. Of course this t-shirt makes the perfect gift and is a must have for any married male on the planet. 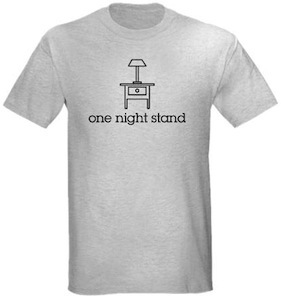 It shows a night stand and below that the text “one night stand”. Of course this is completely correct but most people think of something different as you talk about one night stand’s. And of course that makes it funny. If you like a nice t-shirt with a bedside table on it then this is the shirt to get. OK, so you have studied for years and you know the entire anatomy of the human body, but do you know the anatomy of the stick figure? 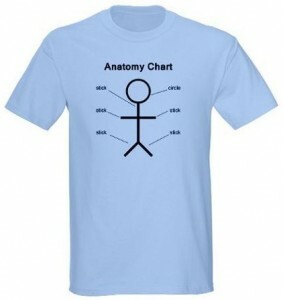 Well this will help out, A t-shirt that features the anatomy chart of a stick figure, you will notice it looks just like an official anatomy chart pointing out the key components that make up a stick figure like the stick and the circle, and the text bove saying “Anatomy Chart”. With a soft and comfortable feel this t-shirt can be found in many sizes and colors. Do you need a shirt that draws attention with a complex idea, but such a simple image that really just draws awareness of the environment around you. This is a great t-shirt that defines Perception, a silhouette of an orange elephant standing beside a stunning tree with many different bold and fine lines of branches. Made from 100% cotton and very durable yet soft and comfortable. Find this perception t-shirt in many sizes and colors as well. Bacon, Bacon, Bacon! If your like me you just want everything to be Bacon and you can not function with out a dose of bacon. 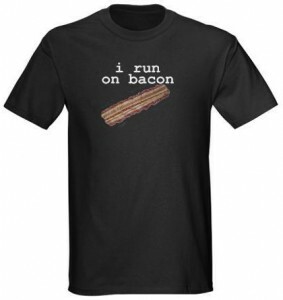 This is the perfect t-shirt for the bacon lover, features a nice greasy piece of bacon and the text “i run on bacon” on the front of this t-shirt. Made from 100% cotton a comfortable and durable t-shirt that can be found in many sizes.